..- Choice of one item served with Mexican style rice & refried beans. 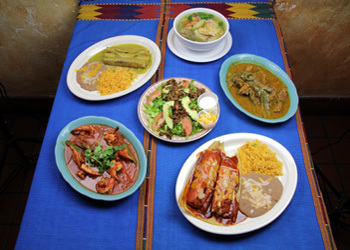 ..- Beef, Chicken, or Soy crisp taco, Cheese, Chicken or Soy enchilada, Beef or Chicken Tamale. ..- Choice of two items served with Mexican style rice & refried beans. 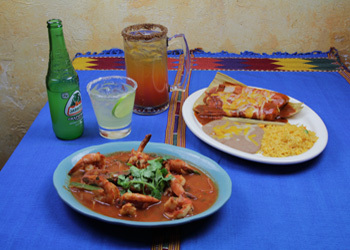 ..- Mexican Dessert and a non-alcoholic beverage (fountain drinks, Ice Tea or coffee). 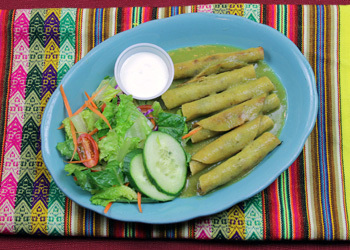 ..- Choice of Mole Poblano or Pipian served with Mexican style rice & refried beans, Green Salad, and Tortillas. ..- Choice of Beef, Chicken or Shrimp fajitas seasoned and cooked to perfection with fresh Onion, Bell pepper and tomato served with Mexican style rice & refried beans, Green Salad, and Tortillas. ..- Mexican Dessert and a non alcoholic beverages (fountain drinks, Ice Tea or coffee). RECEPTION TRAY available by request. ..- Our delicious signature Carne Asada and Grilled Shrimp plate served with Mexican style rice & refried beans, Guacamole, Green Salad, and Tortillas . ..- Mexican Dessert and a non alcoholic beverage (fountain drinks, Ice Tea or coffee). 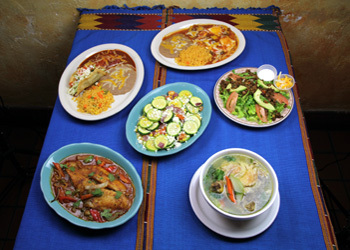 ..- Prepared in your choice of al mojo, ranchera, fajitas,or enchiladasMexican style rice & refried beans, Green Salad, and Tortillas.